In order to help colleagues lobby their MPs for the Second Reading of the HE Bill, we have collated some example letters below. Please do write/rewrite in your own words! Letters that are written in this way are more likely to be read. We have also highlighted parts of the text you should change. These are written by/for Higher Education staff. But you should be able to adapt them, whether you are a student, a parent, or a school or FE teacher. Note that due to devolution, the impacts – and the perceived impacts – are likely to differ across the four nations. So we have drafted different letters. As one of your constituents, and as someone working in Higher Education, I am writing to urge you to attend Parliament and vote against the Government’s Higher Education and Research Bill at the Second Reading on 19 July. The Brexit vote has plunged British universities into profound uncertainty and a looming financial crisis, as the future of EU students and EU research funding are placed in doubt. The last thing our universities need now is the regulatory upheaval and market chaos that this Bill would unleash. 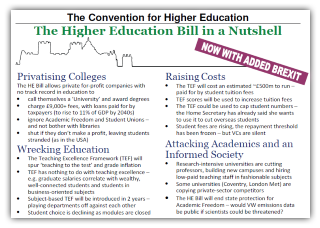 The Bill primarily aims to hasten market entry for ‘alternative providers’ who will be able to cherry-pick cheap-to-provide courses and undercut established universities. Quality Assurance regulations have been weakened in advance, permitting a two-tier university sector. Rather than achieving the stated aim of widening participation, poorer students will become the recipients of cheap, lower quality degrees. Meanwhile the UK’s world leading universities will find their financial stability – already shaken by recent policy changes – profoundly undermined, merely to grant market share to dubious private interests. The last influx of private institutions – who now receive 10% of state-backed funds (£700m) – created a budgetary crisis in the Department for Business. Expansion could further destabilise government finances. The Bill is largely being justified as necessary to improve teaching quality, proposing a new Office for Students to implement a ‘Teaching Excellence Framework’ (TEF). However, while there is always room for improvement, there is no real evidence of poor teaching in British universities. In fact, EU research identifies our universities as the best in Europe for research and teaching. National Student Satisfaction scores have steadily risen, year on year. Moreover, the proposed ‘TEF’ would be a highly bureaucratic exercise that will not and cannot measure teaching quality. Rather, it would focus on things like graduate employment destinations – which are beyond universities’ control and strongly correlated with social background – and student satisfaction scores – which, research shows, are not correlated with educational outcomes and exhibit bias against women and minority-ethnic lecturers. The National Union of Students, representing the students for whom this is supposedly designed, has described the TEF as a ‘crude measure’ and suggested that its unintended consequences are ‘worrying’. Ironically, the parallel ‘Research Excellence Framework’ is so wasteful – costing £244m in 2014 – that it is now subject to a government inquiry. The cost of this added regulation will also be borne by universities and thus indirectly by fee-paying students and their families, thereby reducing, not improving, ‘value for money’. Universities already spend 8 percent of teaching budgets (£1.1bn) annually on regulatory compliance. If TEF is implemented, bureaucracy within universities will expand and we will have even less money to spend on improving teaching. Indeed, teaching quality will fall. TEF will force universities to hollow out the teaching of academic subjects and ‘teach to the test’ to maximise their scores. The Bill is justified by vague statements about improving access to HE for disadvantaged groups. I share this laudable goal. But the Bill does not address this challenge except rhetorically. No extra resources are envisaged, beyond fee rises in line with inflation (currently 0.5%) which would not even cover the costs of TEF. The Government also envisages that the restriction that means that a university is responsible for teaching courses to completion will be reduced. The aim is to make speculative ventures into the Higher Education market more attractive for private investors. But the risk will be entirely at the expense of students. Students could easily find themselves with nowhere to complete their degrees, despite investing thousands of pounds in their education. Even if this does not happen they may graduate with a degree which has little or no value to future employers. Please attend Parliament on 19 July and oppose this Bill. I look forward to hearing from you. As one of your constituents, and as someone working at (Queen’s University, University of Ulster, Stranmillis University College, St Mary’s University College –delete as appropriate) I am writing to urge you to attend Parliament and vote against the Government’s Higher Education and Research Bill at the Second Reading on 19 July. While the Government’s Bill may be presented as impacting on the English University sector, there are also significant negative implications for Northern Ireland. I would strongly urge you to vote against the bill rather than abstain. The Brexit vote has plunged UK universities into profound uncertainty and potential financial crisis, as the future of EU students and EU research funding are now in doubt. The last thing our universities need now is the regulatory upheaval and market chaos that this bill would unleash. 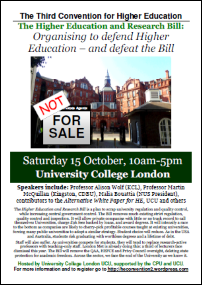 The Higher Education and Research Bill primarily aims to ease the path of market entry (and future exit) of ‘for-profit private providers’ who will be able to cherry-pick cheap-to-provide courses and undercut established universities. The outcome will be a two-tier university sector: cheap, lower quality degrees for poorer students and high cost, high quality degrees for an elite minority with the financial means to afford these high costs. Our existing universities’ financial stability will be profoundly undermined, merely to grant market share to dubious for-profit private interests who will then also be permitted to exit the market if profits are insufficient. While low cost/quality for-profit providers entry into the Northern Ireland market will most likely be primarily through distance learning, it is important to remember that roughly a quarter of NI domiciled students study in English, Scottish or Welsh Universities, their grants and student loans being paid for out of the NI HE budget. These students will be vulnerable to the easy-exit provisions of the Bill. The Government envisages that the restriction that means that a university is responsible for teaching courses to completion will be reduced. The aim is to make speculative ventures into the Higher Education market more attractive for private investors. But the risk will be entirely at the expense of students. Northern Ireland domiciled students could easily find themselves with nowhere to complete their degrees, despite the Assembly investing thousands of pounds in their education. Even if this does not happen they may graduate with a degree which has little or no value to future employers. The Higher Education and Research Bill is largely being justified as necessary to improve teaching quality, proposing a new Office for Students to implement a ‘Teaching Excellence Framework’ (TEF). However, while there is always room for improvement, there is no evidence of poor teaching in Northern Ireland Universities and Colleges. EU research identifies UK universities as the best in Europe for research and teaching. National Student Satisfaction scores have steadily risen, year on year. But the TEF is totally flawed. Instead of evaluating courses by their teaching, the TEF instead seeks to utilise quantitative metrics as a definitive ranking of quality. It would be a highly bureaucratic exercise that will not and cannot measure teaching quality. The cost of this added regulation will also be borne by universities and thus indirectly by fee-paying students and their families, thereby reducing, not improving, ‘value for money’. Universities already spend 8 percent of teaching budgets (£1.1bn) annually on regulatory compliance. If TEF is implemented, bureaucracy within universities will expand and we will have even less money to spend on improving teaching. Indeed, teaching quality will fall. TEF will force universities to hollow out the teaching of academic subjects and ‘teach to the test’ to maximise their scores. The Higher Education and Research Bill is also justified by vague statements about improving access to HE for disadvantaged groups. But the Bill does not address this challenge except rhetorically. No extra resources are envisaged, beyond fee rises in line with inflation (currently 0.5%) which would not even cover the costs of TEF. The Higher Education and Research Bill further seeks to centralise research funding into one major UK-based funding council. The impact of such centralisation is likely to lead to a reduction in research funding and narrowing of focus in its areas of interest for research funding. The outcomes of this for NI universities raises still further concerns. It is for this and many other reasons that the sector made some 650 submissions to the original green paper proposals overwhelmingly rejecting the direction of travel now being undertaken by the UK Government. I would urge you to consider the Higher Education and Research Bill to be a piece of legislation with significant impact on Northern Ireland, and therefore something you would be correct to vote against. As one of your constituents, and as someone working at a Scottish University, I am writing to urge you to attend Parliament and vote against the Government’s Higher Education and Research Bill at the Second Reading on 19 July. While higher education in Scotland is a devolved issue, the Government’s Bill contains many elements that will impact negatively on the Scottish Higher Education system and therefore I would urge you to vote against the Bill rather than abstain. In Scotland, specifically, while low cost/quality for-profit providers entry into the market will most likely be primarily through distance learning, Scottish students will nevertheless be vulnerable to the easy-exit provisions of the Bill. The Government envisages that the restriction that means that a university is responsible for teaching courses to completion will be reduced. The aim is to make speculative ventures into the Higher Education market more attractive for private investors. But the risk will be entirely at the expense of students. Scottish students could easily find themselves with nowhere to complete their degrees, despite investing thousands of pounds in their education. Even if this does not happen they may graduate with a degree which has little or no value to future employers. The UK Government’s Bill moves in the opposite direction to that sought by the Scottish Government whose approach to widening access has already proven to be effective. In England the last influx of private institutions – who now receive 10% of state-backed funds (£700m) – also created a budgetary crisis in the Department for Business. We have already seen how market and regulatory pressures on London Metropolitan University have led to massive course closures and the proposed redundancy of a third of all staff. The Higher Education and Research Bill is largely being justified as necessary to improve teaching quality, proposing a new Office for Students to implement a ‘Teaching Excellence Framework’ (TEF). However, while there is always room for improvement, there is no evidence of poor teaching in UK or Scottish universities. In fact, EU research identifies our universities as the best in Europe for research and teaching. National Student Satisfaction scores have steadily risen, year on year. In Scotland we have developed a collaborative approach to quality assurance through the embedding of Enhancement-led Institutional Review (ELIR). ELIR seeks to develop a culture of improvement in which quantitative outcomes are used to guide enhancement. TEF instead seeks to utilise quantitative metrics as a definitive ranking of quality. If TEF goes ahead there will be strong pressure on Scottish Universities to join the process, due to the risk that non-Scottish UK and international students will use TEF scores in their choice of universities. The proposed ‘TEF’ would be a highly bureaucratic exercise that will not and cannot measure teaching quality. Rather, it would focus on things like graduate employment destinations – which are beyond universities’ control – and student satisfaction scores – which, research shows, are not correlated with educational outcomes and exhibit bias against women and minority-ethnic lecturers. Ironically, the parallel ‘Research Excellence Framework’ is so wasteful – costing £244m in 2014 – that it is now subject to a government inquiry. The cost of this added regulation will also be borne by universities and thus indirectly by fee-paying students and their families, thereby reducing, not improving, ‘value for money’. Universities already spend 8 percent of teaching budgets (£1.1bn) annually on regulatory compliance. If TEF is implemented, bureaucracy within Scottish universities will expand and we will have even less money to spend on improving teaching. Indeed, teaching quality will fall. TEF will force universities to hollow out the teaching of academic subjects and ‘teach to the test’ to maximise their scores. The Higher Education and Research Bill is also justified by vague statements about improving access to HE for disadvantaged groups. But the Bill does not address this challenge except rhetorically. No extra resources are envisaged, beyond fee rises in line with inflation (currently 0.5%) which would not even cover the costs of TEF. Indeed, the Scottish Government’s approach to widening access will be undermined by the provisions for for-profit entrants and TEF. The Higher Education and Research Bill further seeks to centralise research funding into one major UK-based funding council. The impact of such centralisation is likely to lead to a reduction in research funding and narrowing of focus in its areas of interest for research funding. The outcomes of this for Scottish universities raises still further concerns. It is for this and many other reasons that the sector made some 650 submissions to the original green paper proposals overwhelmingly rejecting the direction of travel now being undertaken by the UK Government. Finally, it is important to mention that while the Brexit vote has increased uncertainty in the Scottish University sector and raised the potential for a second independence referendum in Scotland if the UK Government HE Bill were to be implemented Scottish Universities would have already been negatively impacted prior to any moves towards independence in Scotland. Again therefore I would urge you to consider the Higher Education and Research Bill to be a piece of legislation with significant impact on Scotland and therefore something you would be correct to vote against. As one of your constituents, and as someone working at a Welsh University, I am writing to urge you to attend Parliament and vote against the Government’s Higher Education and Research Bill at the Second Reading on 19 July. While the Government’s bill may be presented as impacting on the English University sector, there are also significant negative implications for Wales. I would strongly urge you to vote against the bill rather than abstain. In Wales, specifically, while low cost/quality for-profit providers entry into the market will most likely be primarily through distance learning, over 50,000 Welsh students study in England, their fees paid for by the Welsh Assembly. These students will be vulnerable to the easy-exit provisions of the Bill. The Government envisages that the restriction that means that a university is responsible for teaching courses to completion will be reduced. The aim is to make speculative ventures into the Higher Education market more attractive for private investors. But the risk will be entirely at the expense of students. Welsh students could easily find themselves with nowhere to complete their degrees, despite the Assembly investing thousands of pounds in their education. Even if this does not happen they may graduate with a degree which has little or no value to future employers. The Higher Education and Research Bill is largely being justified as necessary to improve teaching quality, proposing a new Office for Students to implement a ‘Teaching Excellence Framework’ (TEF). However, while there is always room for improvement, there is no evidence of poor teaching in UK or Welsh universities. In fact, EU research identifies our universities as the best in Europe for research and teaching. National Student Satisfaction scores have steadily risen, year on year. It is also highly likely that Welsh universities will be expected to participate in the Teaching Excellence Framework (TEF) because to do otherwise would be to rule ourselves out of a market in students in competition with English universities. But the TEF is totally flawed. Instead of evaluating courses by their teaching, the TEF instead seeks to utilise quantitative metrics as a definitive ranking of quality. It would be a highly bureaucratic exercise that will not and cannot measure teaching quality. Rather, it would focus on things like graduate employment destinations – which are beyond universities’ control – and student satisfaction scores – which, research shows, are not correlated with educational outcomes and exhibit bias against women and minority-ethnic lecturers. Ironically, the parallel ‘Research Excellence Framework’ is so wasteful – costing £244m in 2014 – that it is now subject to a government inquiry. The cost of this added regulation will also be borne by universities and thus indirectly by fee-paying students and their families, thereby reducing, not improving, ‘value for money’. Universities already spend 8 percent of teaching budgets (£1.1bn) annually on regulatory compliance. If TEF is implemented, bureaucracy within Welsh universities will expand and we will have even less money to spend on improving teaching. Indeed, teaching quality will fall. TEF will force universities to hollow out the teaching of academic subjects and ‘teach to the test’ to maximise their scores. The Higher Education and Research Bill further seeks to centralise research funding into one major UK-based funding council. The impact of such centralisation is likely to lead to a reduction in research funding and narrowing of focus in its areas of interest for research funding. The outcomes of this for Welsh universities raises still further concerns. It is for this and many other reasons that the sector made some 650 submissions to the original green paper proposals overwhelmingly rejecting the direction of travel now being undertaken by the UK Government. I would urge you to consider the Higher Education and Research Bill to be a piece of legislation with significant impact on Wales, and therefore something you would be correct to vote against.